In a q-switched InnoSlab laser a slab shaped and contact cooled crystal and a Pockel cell are used. A typical intensity distribution of the output beam in near field is shown in the following figure on the left. Along the small dimension of the pumping cross section the intensity distribution is Gaussian and along the large dimension the intensity profile is nearly top-hat with slight diffraction structures. By using a cylindrical telescope and a spatial filter the laser beam cross section can be symmetrized. The figure on the right shows a typical intensity distribution in far field. After the spatial filter, a rotational-symmetric beam is produced with a beam quality M2 in one direction of 1.1 and of 1.2 in the perpendicular direction. 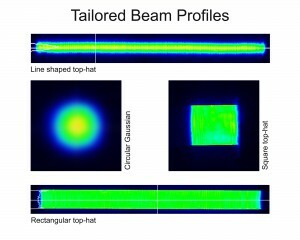 Using a special beam shaping optic the original one dimensional top-hat beam can be transformed to a two dimensional top-hat beam with a rectangular or a square cross section. Laser beams with two dimensional top-hat and rectangular or square cross section are ideal beams for ablation processes with high throughput. To scale the pulse energy and average output power an oscillator/amplifier setup is used. The Figure below shows the typical pulse energy and pulse length of the HD40I-E laser. The pulse energy is 50mJ at 6kHz and the pulse length as short as 7ns because of the short resonator, which is less than 10cm long. The peak power of 7MW is the world record of industry q-switched lasers at multi kHz high repetition rate. The figure in the right shows the output power of a HD40II-E with Nd:YVO4 in dependence of the pump diode current. At 50kHz the average power is 400W. Using two LBO-frequency conversion crystals more than 300W average power in the green spectral range (the second harmonics of the fundamental infrared wavelength) was obtained. The pulse length is 8ns in the infrared (IR) and 7ns in the green (the second harmonic). Our innovation is the InnoSlab technology which enables us to construct lasers that represent a new generation of laser beam sources. InnoSlab lasers are very compact laser sources and have the ability to obtain a high beam quality simultaneously with high efficiency and high output. High flexibility in beam profile – processing with maximum energy efficiency. 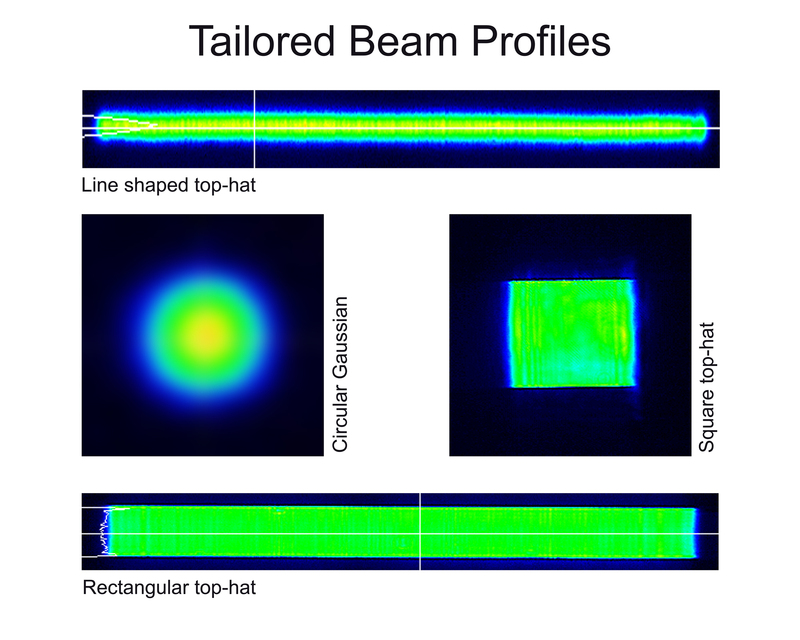 A distinguished and enabling feature of InnoSlab lasers is the tailored beam profile: from circular Gaussian, through line shaped one dimensional Top-hat to square two dimensional Top-hat – customizable for your requirements.